Mark Puente of Nailivic Studios is our selected artist for November! ArtProfiler’s Artist Monthly highlights one artist per month for exceptional work in his or her chosen medium. Boston-native Mark Puente grew up in Guatemala and has always been inspired by images of Dia de los Muertos and folk art from around the world. His pen and ink illustrations are transformed into colorful engravings, which have been laser-cut and etched from milk-paint finished wood and other media. Mark works out of his home in East Austin and is supported by his wife, Amy Exah, who assists in the creative process and the business side of Nailivic Studios. 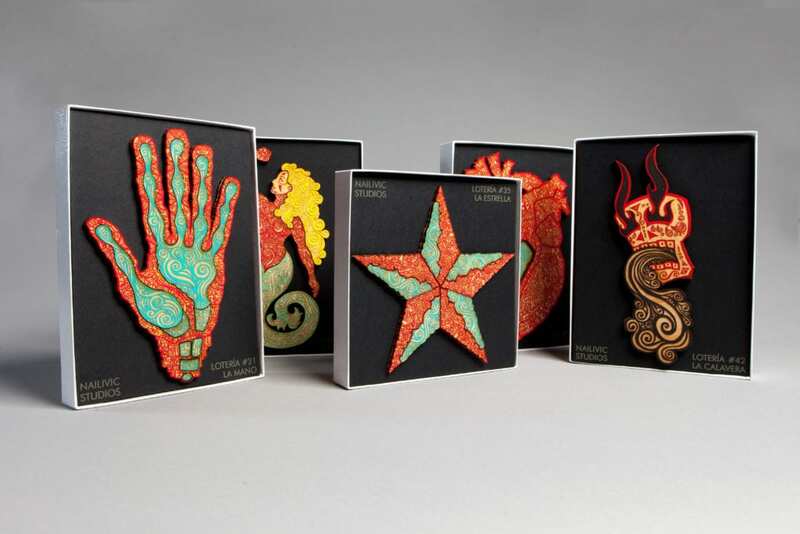 Nailivic Studios produces laser-etched and laser-cut modern folk art both large and small. Nailivic is Civilian spelled in reverse. A civilian has both the right and the responsibility to change society for the best, by any means necessary. We believe in using art as our tool of choice. 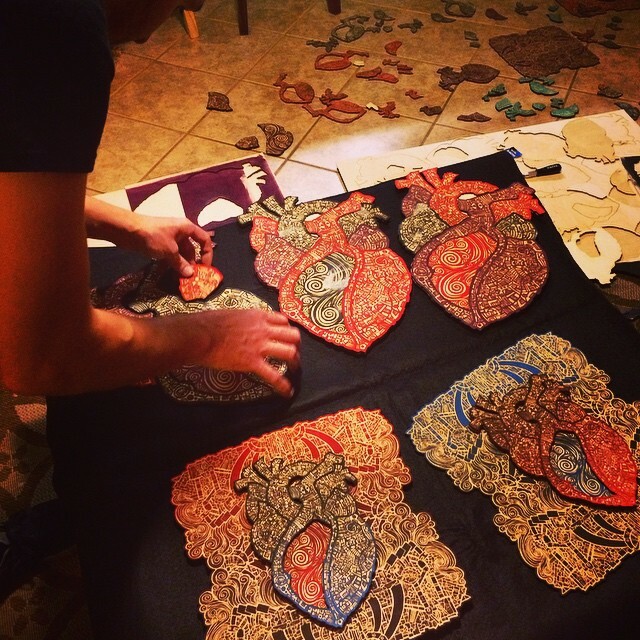 Nailivic’s works are produced in a variety of sizes and, in addition to laser-etched wood pieces, include t-shirts, posters and earrings. All designs are based on Mark’s illustrations and can be seen in person this weekend (Nov 17-18) at MakeATX for the EAST Austin Studio Tour (tour #325), at the Cherrywood Art Fair, the Blue Genie Art Bazaar and the Armadillo Christmas Bazaar. You can also find the duo every Saturday on S. Congress at the Soco Select Farmers & Makers Market. 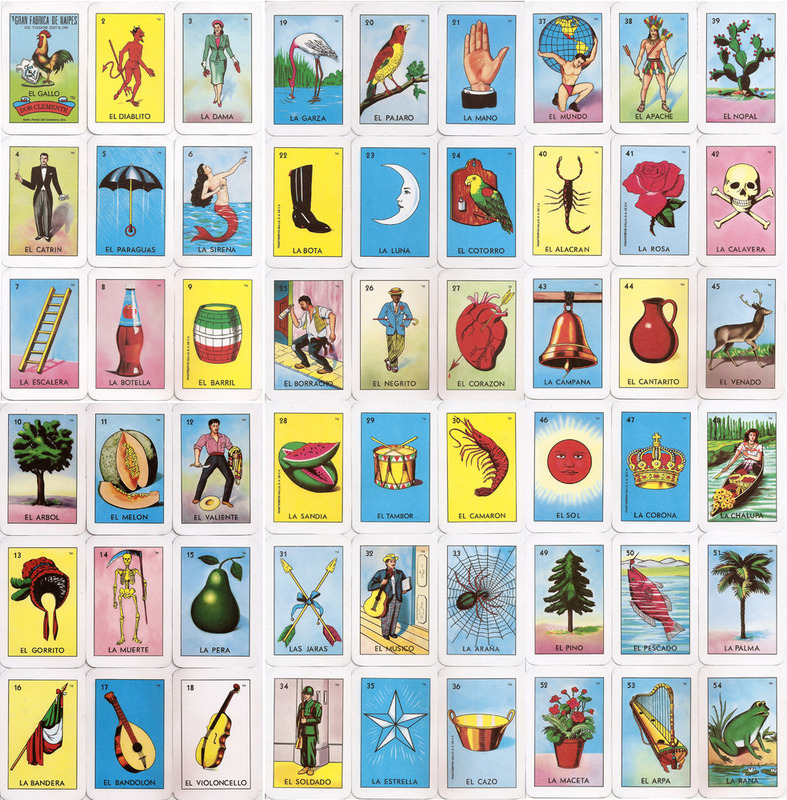 Mark is in the process of creating his own version of the 54 cards found in Lotería, a bingo-like game played in Mexico and the southwestern USA with a game board and a deck of 54 cards. He is well on his way because he already has ten designs inclding La Sirena (the mermaid), El Corazon (the heart) and La Mano (the hand). From an artistic point of view, the goal of creating each of these pieces keeps Mark grounded and focused in his artistic ideas. 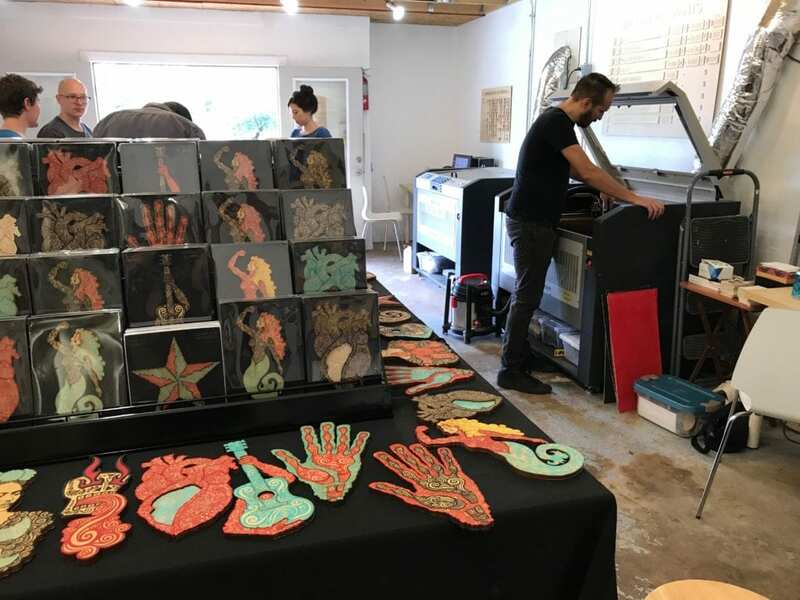 In a broader sense, although Nailivic Studios is currently the home to only one artist, Mark uses the plural form of ‘studio’ because his long term goal is to make Nailivic an envelope for other artists selling their modern folk art. He would like to eventually house other artists, have students and provide mentorships to young artists and encourage them to realize everyone can make a living off his or her art and affect social change in the world by having their art in as many hands as possible. The idea is a thousand stories in a thousand homes. Every time someone brings home a piece of an artist’s work, they have their own story or connection to it — it inspires, motivates or affects them in different ways.